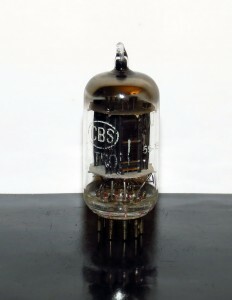 This entry was posted in Vacuum Tubes and tagged 12ax7/ECC83, CBS-Hytron by tubemaze. Bookmark the permalink. This tube is as rare as it gets – just try searching for it on Google or Bing. It’s one of the earliest production tubes with very shiny black plates and horseshoe getter. It’s kind of sad that tubes like that disappeared shortly after they have been released. There is very little info on why, but industry switched to more “efficient” tubes and tried to reduce cost, so all the good stuff melted away after late 50s. This tube is a true beauty – it’s super transparent, but at the same time its very detailed – its should be the same thing, but this tube really demonstrated how detailed sound could really be. Add to that very tight and rich bass and you have a winner. Mid-range is musical, but not as good as in early Sylvania tubes. True relic of the past that puts all new production tubes to shame. The majority of NOS tubes are also losing to this tube by a big margin.